Another rotation last week, as the Dow Jones took a break and the Nasdaq recovered slightly, thanks in part to biotechs. Will there be a different winning sector this week? 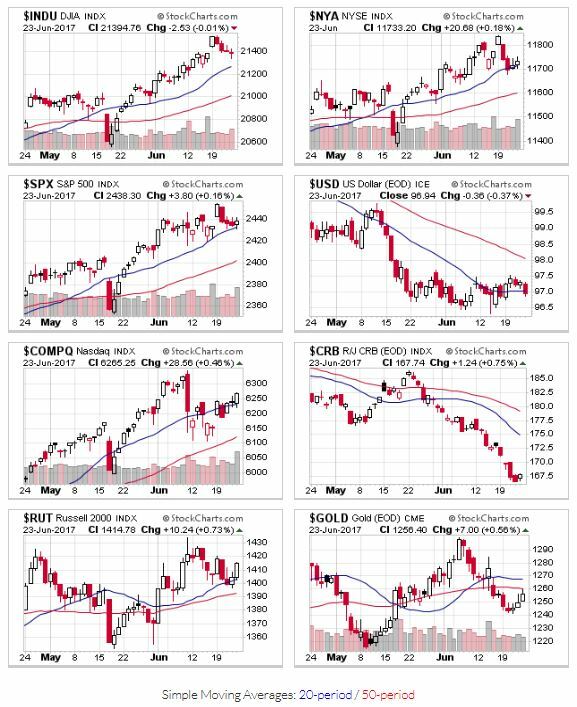 With the Nasdaq’s stronger showing last week, all the indexes start this week above key support levels (20 and 50 day moving averages), so no change in signal. Price/volume action continues to support an uptrend, though distribution days remain elevated. No change in midterm OEW signals; the uptrend stays in place, but may have topped. Best of luck this week. Last Sunday, I mentioned some of my newer holdings had retreated to buy points. During the week, those positions hit sell triggers (so I’m out), and my weekly scan shows that stocks with the best fundamentals are at profit taking levels (+20%) or are extended from proper technical buy points and bases.